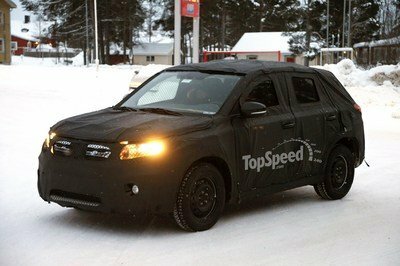 The Soul’s redesign for 2014 keeps the boxy look of the original car, but updates it with wraparound-look glass and a sportier greenhouse. 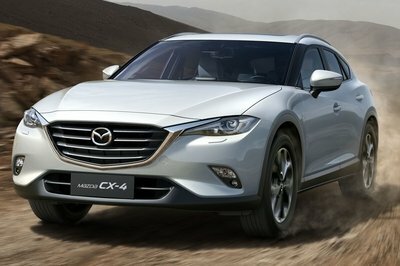 It’s distinctive and looks cool rather than appearing to be just another economy car. In terms of styling and visibility, the Soul EV splits the difference between the electric-only 2014 Nissan Leaf and Ford’s nigh-invisible 2013 Ford Focus Electric. 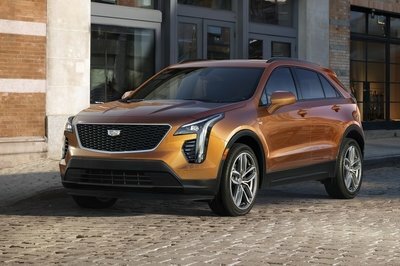 It shares all of its sheet metal with the conventional Soul, but sports an EV-only paint job with a contrasting roof and mirror caps, and fancy wheels that look like new sneakers. 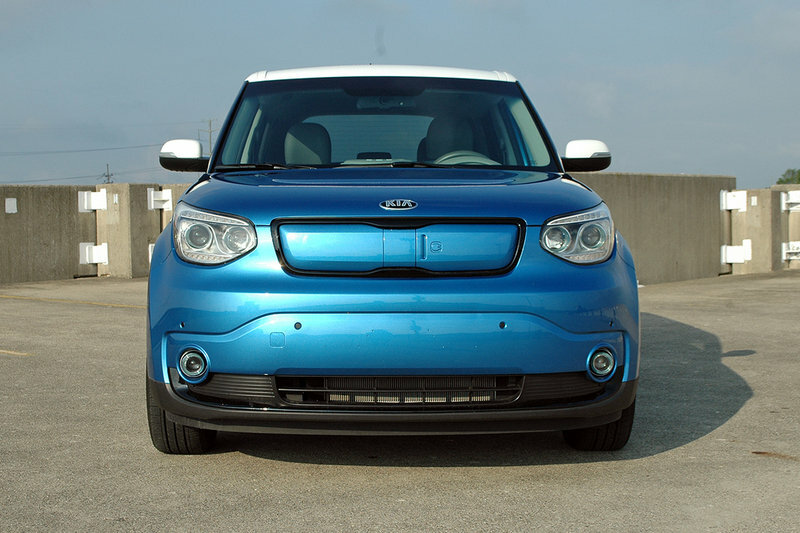 The most noticeable change is that the Soul’s family grille has been replaced by a charging port under a body-colored panel. 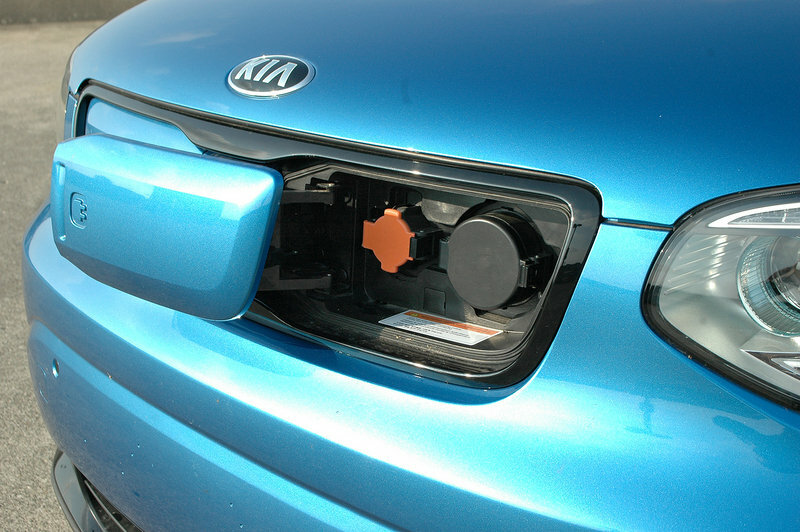 Projector headlamps and LED exterior lighting are also EV signifiers. The Soul is a confident-looking car, and the Soul EV’s special tweaks give it a unique, five-minutes-into-the-future look. 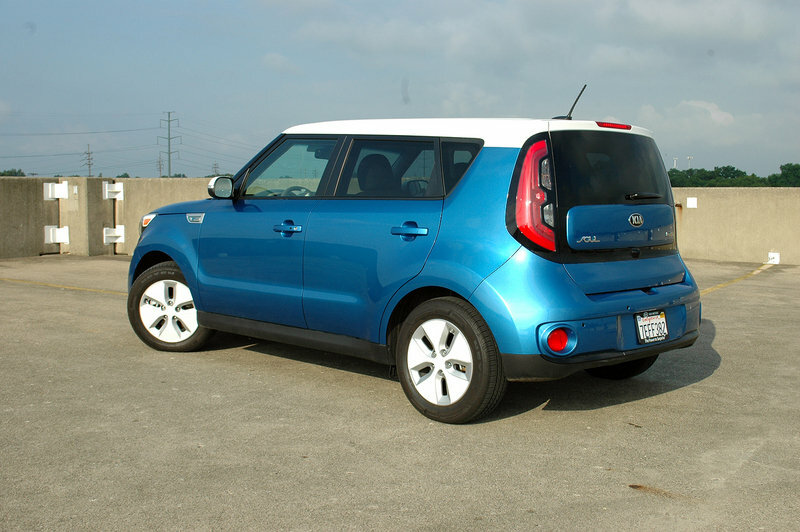 One thing I did notice about the Soul EV’s look: it makes current Soul owners want one. The iPod-white trim on the dash and doors drew special covetous attention. The look goes well with the Soul’s light-hearted nature. 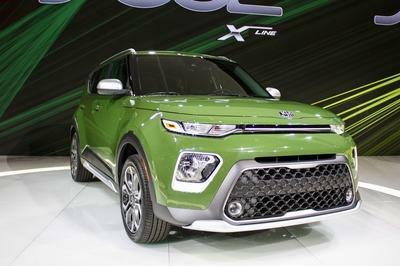 The cool tower-style air vent and speaker combination units on the dash give the Soul EV a show-car look. Like other electrics, the Soul EV can be set to run the air conditioner before startup on hot days via UVO EV Services. 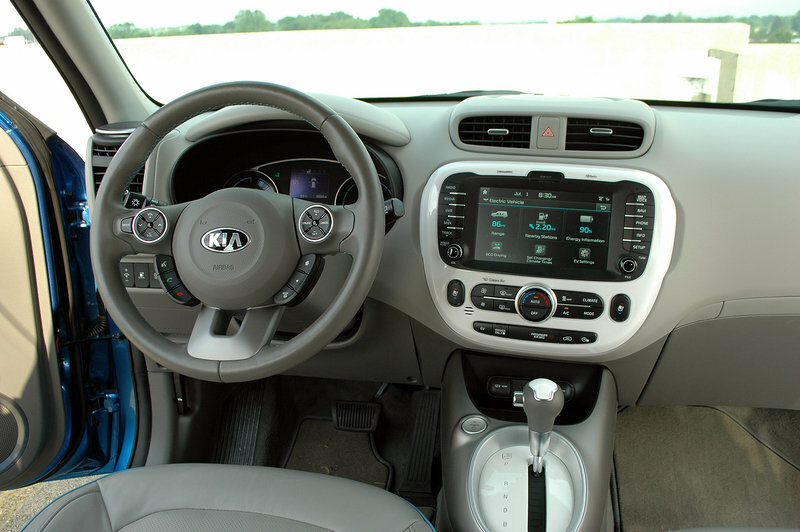 Standard equipment includes a navigation system and backup camera, both of which utilize an eight-inch screen on the dash. There’s an efficient air conditioning system that’s designed to minimize battery drain. I saw no dramatic drop in range with the AC on or off. A variety of eco-friendly items lie beneath the skin as well, including low-temperature organic LED lighting in the dash and a high percentage of organic-rated interior content. The battery lies flat under the floor, so cargo space and interior room are not significantly affected. The only change is that rear-seat legroom is decreased by just over three inches. This is an electric on the same philosophy as the Focus and Golf, in that’s it’s aesthetically the same as the conventional version. That’s a good thing, because the Soul is a comfortable and surprisingly spacious vehicle. Range is the only functional difference noticeable from the driver’s seat. Thanks to Kia’s UVO EV Services, a standard app, the Soul EV’s pretty accurate about range, and will reliably go 80-90 miles before threatening to stumble to a halt. That gives it the longest range of any electric other than the much more expensive Tesla. Especially approved of is the charge-time estimator and charging-station list powered by the navigation system. Though not all of the charging stations listed appear to be public, it’s a helpful guideline for what’s out there. The charger cord stows under the rear cargo floor so it’s out of the way. Like other electrics, the Soul EV can be set to run the air conditioner before startup on hot days via UVO EV Services. Obviously, apart from the trim, what sets the Soul EV apart from the rest of the lineup is the 109-horsepower electric motor. Torque is rated at 210, and it’s available at all rev ranges. 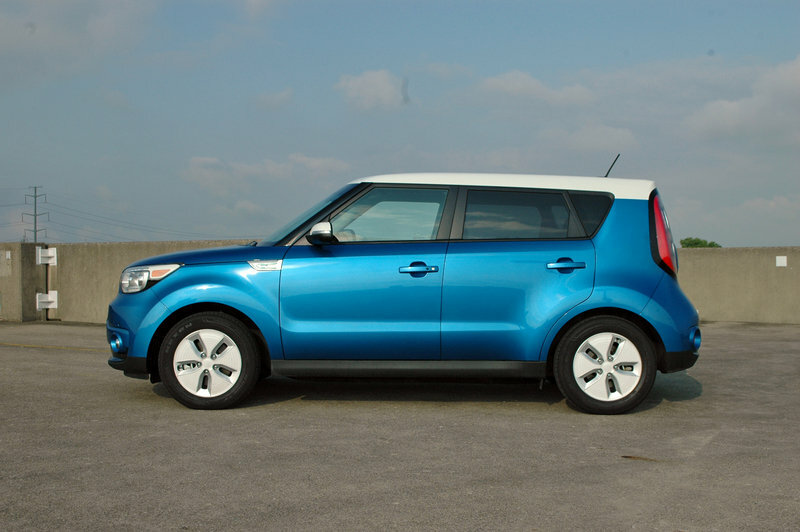 Fed by a 27 kWh lithium ion polymer battery, the Soul EV is good for about ninety-three miles of driving before it needs to be plugged in. A standard port for Level 1 and Level 2 charging is mounted right next to a CHadeMo DC fast-charging port that can bring the battery back to 80 percent in less than an hour. Standard charging time is between five and eight hours. 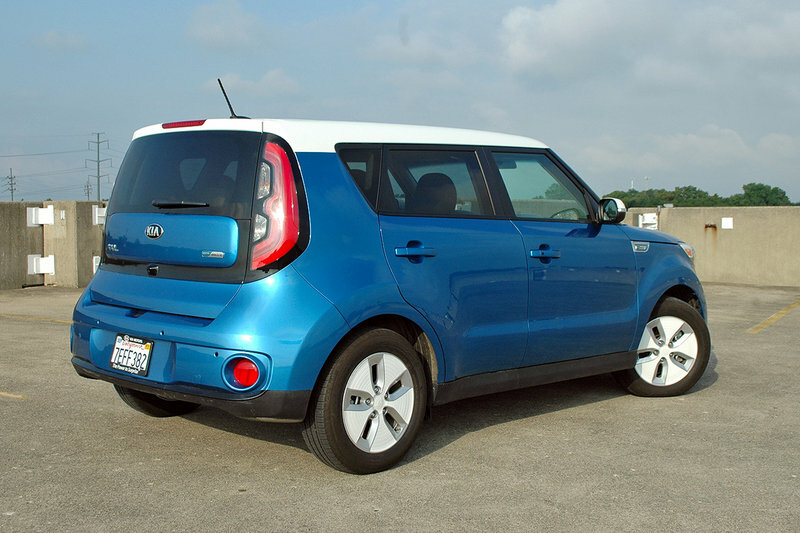 The Soul EV puts the power to the road via a single-speed transmission driving the front wheels, typical for electrics. Of the electrics I’ve met, the Soul EV is definitely the most friendly. Like other electrics, it’s almost eerily silent, whirring off the line like a golf cart and only interrupting the solace with tire noise on the freeway. It drives like a slightly more powerful Soul (thanks to the torque), and the EV functions are very easy to use. Like other electrics, it's almost eerily silent, whirring off the line like a golf cart and only interrupting the solace with tire noise on the freeway. Driving dynamics are the same as the Soul’s, other than acceleration and brake feel. The regenerative brakes are grabby enough to stop the car much quicker than conventional coasting when you lift, and provide a tiny bit of trickle-in battery charge along the way. The suspension is unchanged, though the low-rolling-resistance tires provide a slightly firmer ride. The Soul EV gets really antsy if you let the battery run below 30 percent, issuing constant reminders that charge is low and offering directions to the nearest public charging station. Of the electrics I’ve driven, the Soul’s remaining-mileage indicator was one of the most honest, reducing range anxiety — at least in the driver. A big part of the electric-car experience is the necessary fuss of making sure it’s plugged in whenever possible. This can be a surprisingly inconvenient adjustment, as without a home charger this means running an extension cord out to the car’s plug. The on-board charger is designed to use a standard household 110-volt outlet if no dedicated charger is available, but that’s cold comfort when wrestling with a wet extension cord in the rain. Charging is not a quick affair when plugged into a 110v outlet, either; the Soul EV can take up to 15 hours to reach a full charge. Some days that’s not even enough for a full power-up between work days. Such are the adjustments that need to be made for a gas-free vehicle these days. 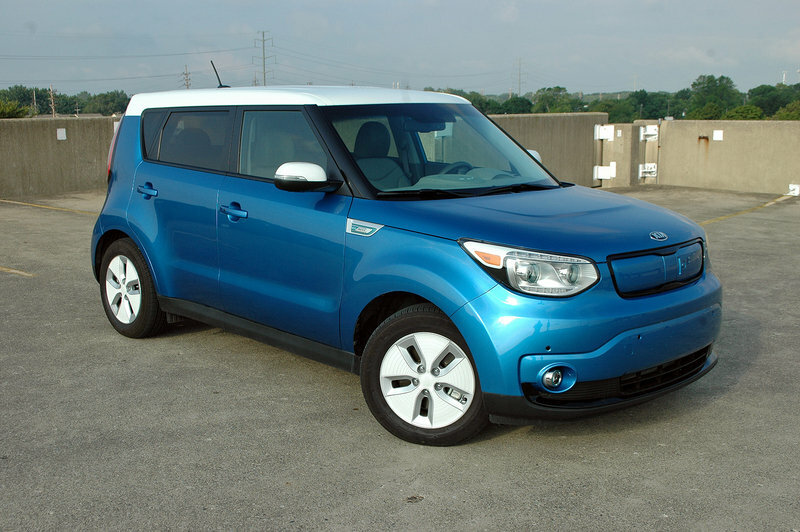 The Soul EV naturally commands a bit of a premium over the average Soul. 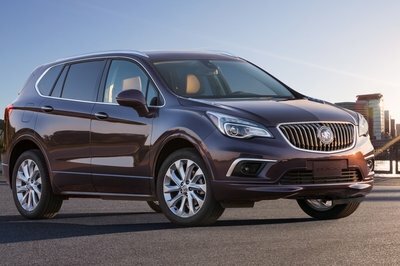 In fact, the bottom line of $34,500 is a bit startling at first, considering Kia’s reputation for pricing that’s easy on the wallet. 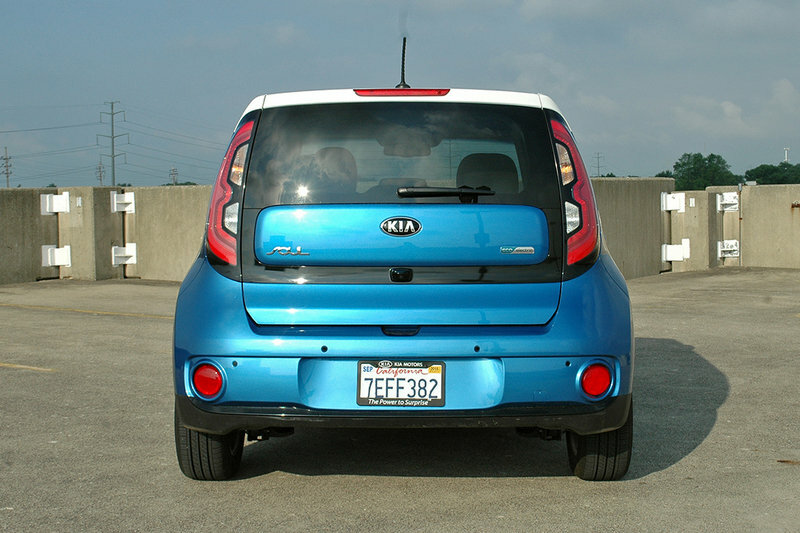 But in comparison to other electrics, Kia is closer to mid-pack. The MSRP is higher than that of the Nissan Leaf or Ford Focus Electric, but similar to the 2016 Volkswagen eGolf and 2014 Fiat 500e. Interestingly, my test car was $36,325 out the door, but the window sticker failed to show which options were installed that drove the price up. 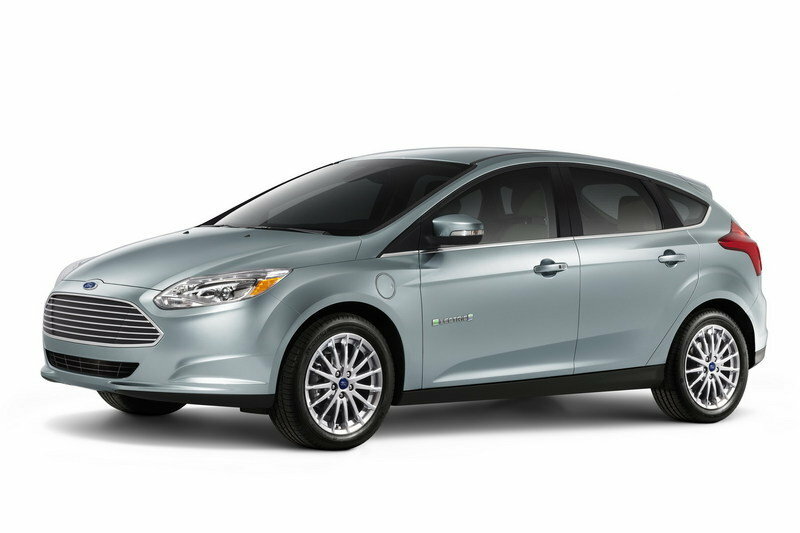 Ford’s electric Focus has been all but invisible, and it’s on the verge of being remembered as one of the first generation of electric versions of gas-powered compacts. The Focus Electric is a decent performer that’s identical to the standard Focus on the outside, and offers more power than most electrics. It does give up some cargo space, however. 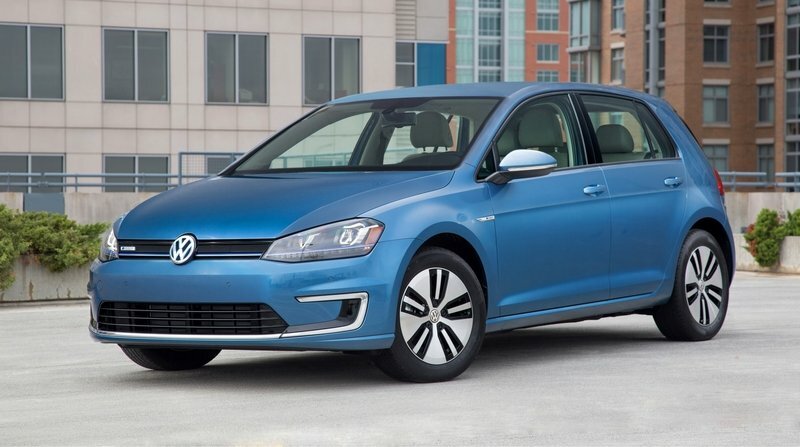 The eGolf translates VW’s entertaining and charming driving manners to electric power perfectly; on the road the only hint that this car’s electric is the lack of engine noise. A comfortable and well-appointed interior and powerful brakes make it a very good errander. 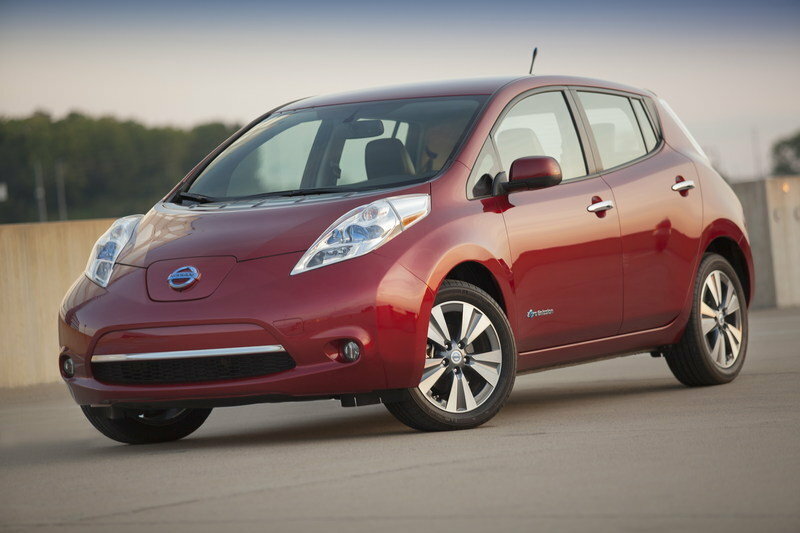 The Leaf is for electric-car owners who want the neighbors to know they’re driving electric. Its unique design isn’t shared with any other Nissan, and confers instant minor-celebrity status. The Leaf is a real car, unlike some electrics. Seating for four plus grocery space and a futuristic interior make it a standout.